Does your new puppy ignore you when you call his name? 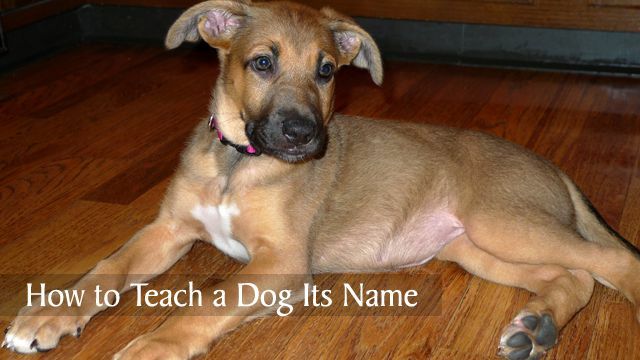 Have you adopted a dog from a shelter or rescue and want to teach him a new name? Maybe you’ve had your dog for awhile and he seems to have selective hearing when you try to get his attention. Earlier this week I posted an article about how to find the perfect name for your dog, so now we’re following up with how to teach a dog its name. The goal in teaching your dog his name is to not just have your dog learn to recognize his name, but learn to respond to his name. By respond, I mean immediately stop whatever he’s doing and look at you for direction. Dogs with selective hearing will respond when they feel like it, but the goal is to have him respond reliably every time. A reliable dog is a joy to live with and you’ll have the peace of mind that you can recall your dog if he’s headed into a dangerous situation one day. Squirrel chasing into traffic or jumping into unsafe waters come to mind. Another reason to teach your dog his name is you’ll use his name to get his attention before issuing a command. Since it’s nearly impossible to teach new commands or train when you don’t have a dog’s attention, the process will be much easier once your pup knows his name. Alright, let’s get started! Start with some tasty treats when your dog is calm and you have his attention. 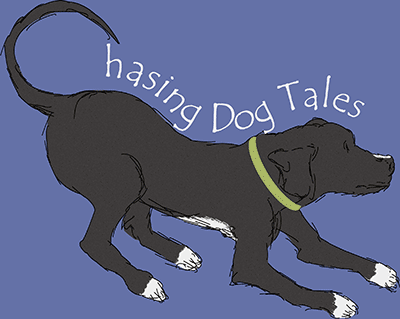 Say your dog’s name with an animated or excited tone of voice. When your puppy looks at you, say “Yes!” or “Good!” and immediately give him a treat. Repeat this process 6-8 times in several sessions a day. Your dog will begin to associate his name with good things happening (he gets a treat). If it’s hard to get your dog’s attention at first, make a little sound when you say his name. You can click a clicker instead of saying “Yes!” or “Good!” when your dog looks at you. Make sure everyone is consistent with using your dog’s name (don’t use nicknames or variations). Try not to overuse your dog’s name in casual conversation or he may begin to tune it out. Always stop the training before your dog gets tired or overwhelmed. Always use your dog’s name in positive situations, never when you’re angry or for discipline. Never use your dog’s name when saying “No!” or with the Stay command. Always give lots of positive reinforcement (a treat or praise) when he responds to his name. Once your dog begins to look at you when you say his name, repeat the exercise in different locations around the house and outside. Next, begin calling his name when his attention is not on you or when he’s slightly distracted. As your dog progresses, try waiting a second or two before giving the treat to see if you can hold his attention a little longer. Once Haley knew her name, I started occasionally whispering her name to her in an excited tone before I would give her something really great, like a special treat or toy. She learned pretty quickly to snap to attention when she heard me whisper her name. This was a fun way of fine tuning her listening skills and teaching her to respond to a quiet tone of voice. Eventually you will phase out the treats, but an occasional surprise treat when your dog listens well is a great way to keep them attentive and interested in listening. Keep it fun, exciting and positive when you call your dog’s name and you’ll be rewarded with a best friend that always listens to you. How well does your dog respond to his name? Do you have any tips on how to teach a dog it’s name? Treats are always a great way for us doggies to learn our names. Mama taught me by repetition. She was always saying my name to get my attention and eventually I learned it! This is a really good trick! I usually teach them their names when they’re eating, so I repeat their names with an enthusiastic voice all the time, haha! That’s a great way to reinforce their name, thanks! I haven’t formally taught Honey her name. But I used it very consistently with her from puppyhood until she recognized I was talking to her. I’m so glad I did. Because when we have foster pups in the house, I’d be lost if I couldn’t give Honey a separate cue from the other dog. Hope more people take your advice. It’s really important for our dogs to know their names. That would be pretty confusing if you have more than one dog in the house. Btw, your post on fostering dogs really has me considering it, great info. I don’t remember actually teaching Ace his name, but I did because when I adopted him I changed it from Junior to Ace. He seemed to catch on pretty fast. It helped that he seemed to have no idea his name was Junior when I got him. He didn’t really respond to anything. He seemed glad to have some direction, so he was always paying attention and looking at me to see if he was doing the right thing. These are some great ideas and I’ll be using them when I adopt my next dog. It seems that most dogs can learn a new name pretty quick if they’re adopted. Ace is one lucky dog! My six month old Shih Tzu was brought home at 2 months old. We have tried the treats technique and she only listens to her name when she knows that we have treats in our hand. We are also having difficulty with her going to the bathroom in her cage EVERY time we put her in it, regardless of how long it is. Hi, Nikki! Maybe try slowly phasing out the treats when training her name, but occasionally surprise her with a treat when she doesn’t realize you have one. In other words, keep her guessing so she’s more likely to pay attention to you. The bathroom issue must be pretty frustrating. It sounds like she’s probably confused about where to go or it’s become a habit (especially if you’ve used training pads in her crate in the past). Normally, dogs don’t like going to the bathroom where they sleep but if her crate is too large, she might be using part of it for a potty area.